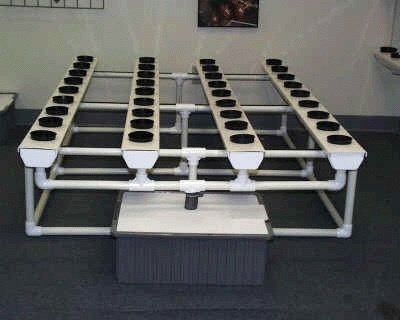 Nutrient Film Technique, or NFT, is a popular and versatile hydroponics system. 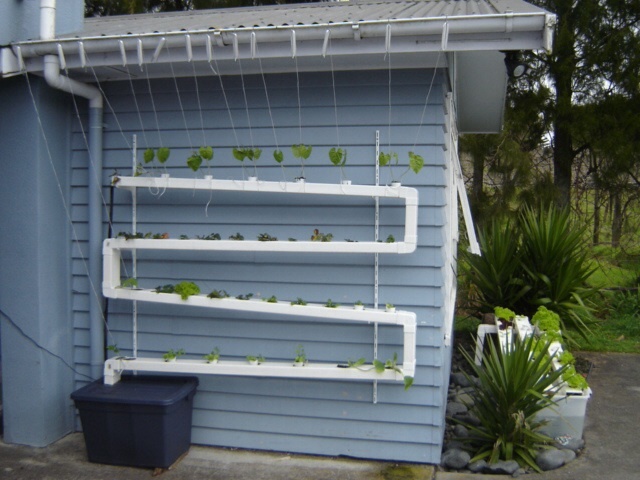 It is similar to Ebb and Flow in that the system uses a pump to deliver fertilized water to the grow tray and a drain pipe to recycle the unused nutrient solution. The difference is that in NFT the nutrient solution is continuously flowing over the roots. 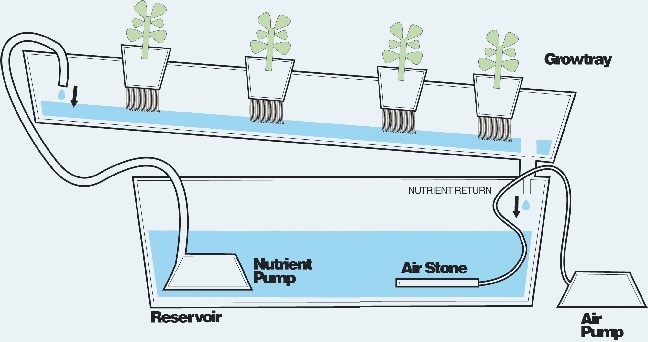 The nutrient solution flows in a thin film over the roots, ensuring that they are watered and fed but not completely soaked. The thin film ensures that the upper part of the roots will remain dry and have access to oxygen in the air. This system works best with smaller plants rather than lager more heavier ones. This being because the roots have nothing to hold onto, so if your in a small net pot or even just a rockwool cube you will be running into top heavy come finishing time. 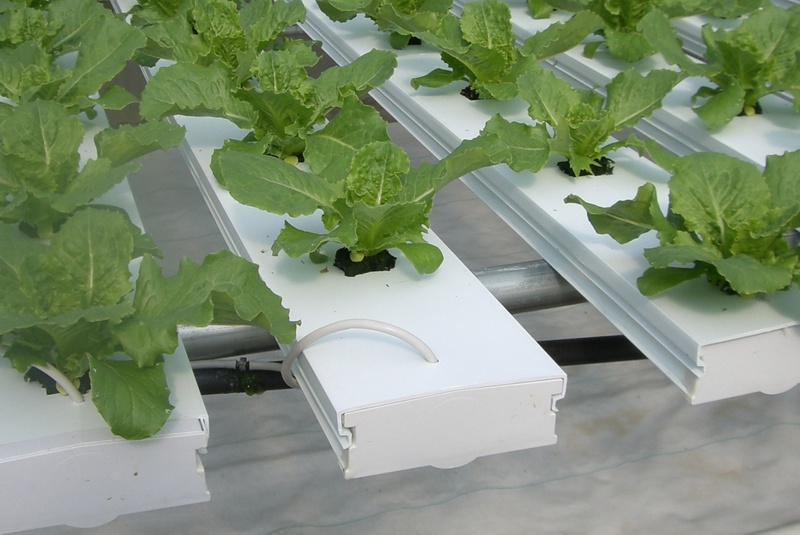 The main components of an NFT system are the same as Ebb and Flow- the difference is their configuration. Failure to use a well designed Chanel or gully will lead to continuous problems such as ponding, blockages and deep nutrient flows which starve the root system of oxygen leading to root death, root disease and crop losses. Your channel or gully must also be made from UV stabilised Food Grade PVC. This type of PVC does not utilise any cheap fillers and won’t leach any harmful chemicals into your system. !! !FEW THINGS TO KEEP THE WATER FLOWING SMOOTHLY!!!!! As with all hydroponic growing applications, the temperature of your nutrient solution is crucial. Try to keep your nutrient solution at around 65-68°F for high levels of dissolved oxygen and optimum nutrient uptake, though nutrient uptake will also be determined on room temps as well ph. Many NFT growers start their plants in 3" rockwool starter blocks and place these directly into the grow tray through neatly cut squares in the Cover or also net pots. Plants grown indoors under lights will take up water at a greater rate than they take up nutrient. Over time the EC of the solution will rise. Regularly top up your tanks with water or 50% strength nutrient solution. Keep your top up nutrient solution in a separate barrel rather than using water straight from the tap. Maintain the pH of your nutrient solution at around 5.8 - 6.2. Check regularly as it can rise as the plants feed. It's okay to turn your pumps off for half an hour while you adjust your nutrient solution's pH and strength. Allowing the ph to drift isn't a bad thing either. Bring it down to 5.2 and allowing to drift to 6.2 will allow different. Minerals to be readily available to the plant. As a general rule, drain your nutrient solution and replace with a fresh batch every 7 to 10 days for optimum yields. Obviously bigger tanks can get away with less frequent changes whereas bigger plants prefer more regular fresh nutrients. Do not let any light leak into the root zone. Ensure the holes in the cover are just big enough for your plants/net pots to fit through. Cover the bases of your plants to prevent green algae forming - especially important if using rockwool cubes. Thoroughly clean your tanks in between crops with a soap/bleach/H2O2 solution and rinse thoroughly. Take the opportunity to observe your plants' root growth directly by simply lifting up the cover or pulling out a net pot!! Make sure you completely remove plastic wrapping from rockwool cubes or remove pots if using soil or coco. This allows the roots to access more oxygen. NFT is a bare rooted growing technique. When they start fruiting, all but the smallest of plants will need additional support, i.e. yoyo's or pea netting,string and my favourite pipe cleaners. Don't crowd them! Plants grow incredibly fast in NFT. So spacing is key, not only for growth but for proper maintenance and observing of the roots. Wait until roots are bursting out of your starter blocks before inserting them into your NFT system. This is absolutely crucial! Be patient - don't go transplanting at the first sign of roots. Use air pruning techniques to really make sure that the propagation media is full of roots before transplanting to your NFT system.